The Happy New Year Banner can be used as a banner at a New Year’s Eve party. It is a way to bring in the New Year either in an office or at home. The banner has a design that represents a celebration and it features the text in big bold letters that say “Happy New Year” with a martini glasses on each side. First, you will want to download the Happy New Year Banner here for free. After you download the banner, open it up in a .PUB file. The file will open up and then you will want to save the file either in your documents, picture or desktop. After the file is saved, you may want to play around with the color by clicking on the page design tab. If you point at the color by using your mouse, you will notice how the colors change without you having to left or right click on it. That way you can choose the color you find the most festive and appealing to you. You can also click on the background tab and change the color of the background. You can change it to either a solid background color or a gradient background color. If you click on the fonts tab that has the upper and lower case Aa, you can change the font. Then you can click on the home tab and highlight the letters and you can change the color of the text. 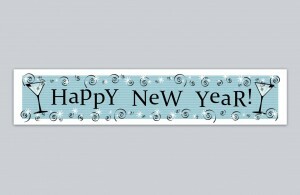 The Happy New Year Banner is both customizable and easy to use. After you have picked the color for the banner, background and text the next thing you may want to do is click on the insert tab and insert a picture. You can scale it to the size you feel is right. The second thing you can do is click on the format tab and change the picture style. You can click on the Recolor option and change the color of the picture image to your liking. The next thing you can do is type in the year. You can change the font style and the color. You can change the size by making it bigger or smaller.